Fisherton Sarum will be exhibited this weekend, the 28th and 29th March, at the London Festival of Railway Modeling at Alexandra Palace, North London N22 7AY. This well established and popular large show is organised by Warners publications, the group behind the British Railway Modelling Magazine in association with The Model Railway Club. The Alexandra Palace is a great venue for the show has many local transport links and also free parking. Fisherton Sarum will be stand 101 located at the organ end of the main Great Hall. There will at least 40 layouts at the show, manufacturers including Bachmann and Hornby along with the usual mix of traders and demonstrators. As with the shows organised Warners there will also be the BRM Village including examples of current projects, an interesting programme of lectures and a chance to meet the team behind the magazine. I hope to see you there, please come and say hello. As usual I will be ably and gratefully assisted by fellow members of the High Wycombe and District MRS and also my Dad. 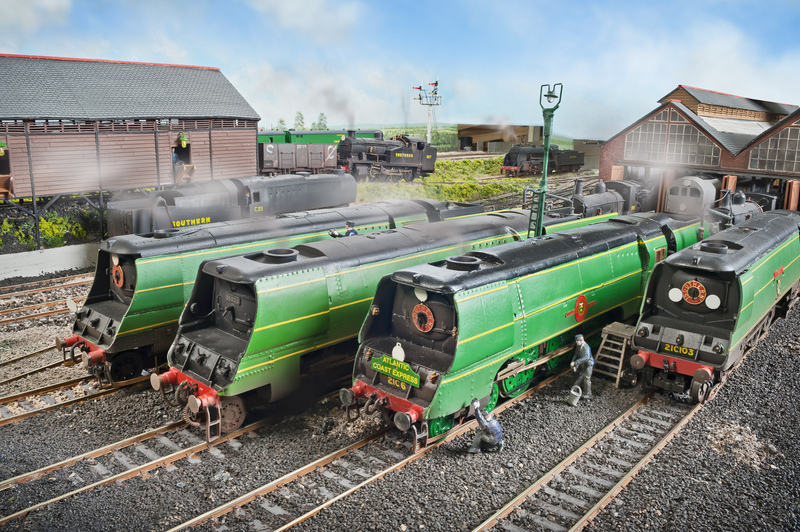 If you unable to attend this weekend then perhaps you might be able to get along to see Fisherton Sarum at one of the other two shows I will be attending this year, see my exhibition diary page here for details. Many thanks for your kind comments I’m glad you liked the layout in the flesh. Next please do not worry about making yourself known it will always be good to say hello in person.